There was increasing variability when welding the hinges onto the footboards and this was risking the quality and functionality of the part. Manufacturing costs were growing to an unacceptable level as production quantities continued to increase. The process to manufacture the shaft piece of this part was too costly and complex. The assembly costs were rising to an unacceptable level. 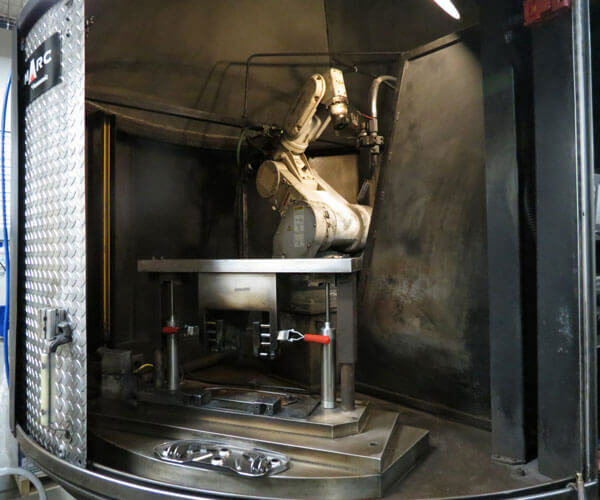 Robotic welding improved the accuracy and quality of the welding process and met the manufacturers growing production demands. The robotic arm of the welder operates with exact precision versus even the slightest variability of a human welder. The programming establishes welding at a continuous pace and increases production rates. 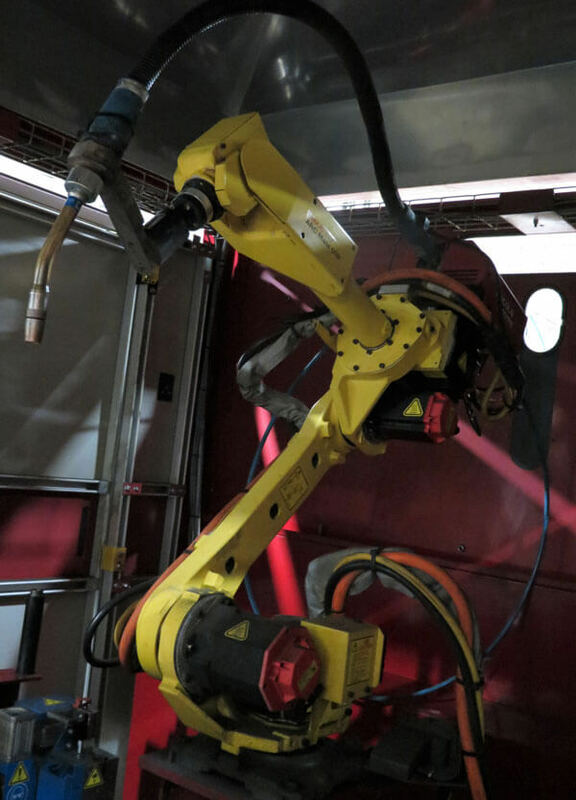 This robotic arm eliminates human errors that occur during set-up throughout the welding process. Each footboard required eight “1- inch” welds so Ultra designed and built a customized welding fixture. 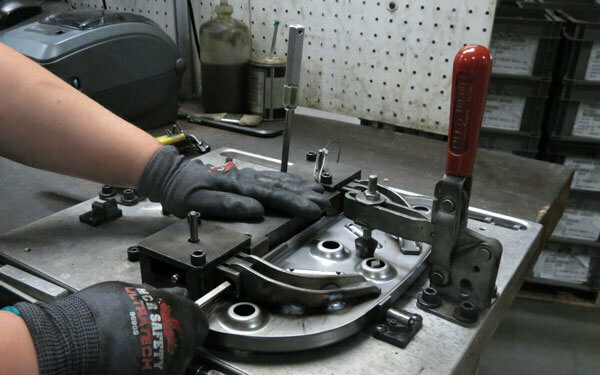 This established a stable location for the robotic arm to weld more consistently and at a faster rate. And with two robotic welders, CNC Panasonic Robotic Welder and the Genesis Robotic Welder, in full operation Ultra can produce two footboards at a time – decreasing downtimes and increasing production rates. A customized functional gage designed and built by Ultra tested the placement of the welded hinges ensuring the footboard was ready for assembly. In addition, the production of this footboard was completely done at Ultra beginning with upfront design assistance to stamping both the left and right-side footboards. Our value-added area completed the process with visual inspections of the final footboards. Production rates were doubled and labor costs were decreased with the introduction of the robotic welder. 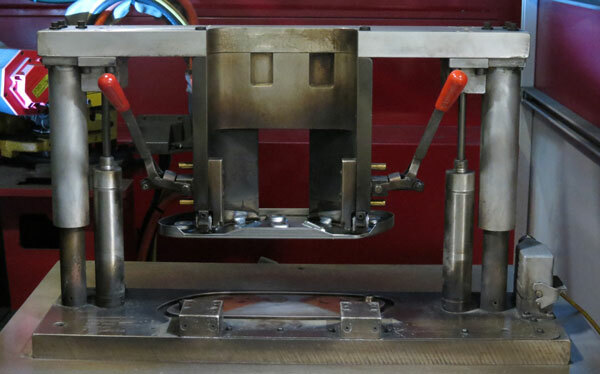 Precision and accuracy of the welding improved for a more secure fit onto the final product.